Click the following link for a 38-photo gallery of action from the Irish round of the Red Bull X-Fighters held at Slane Castle in Ireland. Slane Castle, just outside of Dublin, Ireland was the spectacular setting for the second leg of the Red Bull X-Fighters World Tour, on Saturday, May 26, 2007. More than 35,000 spectators watched as Travis Pastrana won his third X-Fighters event, ahead of Swiss rider Mat Rebeaud and Spaniard Dany Torres. With the head-to-head final pitting Pastrana against Mat Rebeaud canceled due to pouring Irish rain, the American was declared the winner of Red Bull X-Fighters Slane Castle. The final tally was based on the qualifying results from Friday, which Pastrana topped. Always the good sport, Pastrana wanted to settle the match fair and square with a game of Rock, Paper, Scissors, but alas, was rebuffed. Mathieu Rebeaud was tied with Travis Pastrana, but the Friday qualifier results were used to break the tie. The 300-plus-year-old Slane Castle, which has hosted rock bands such as REM, U2 and The Rolling Stones, provided the perfect venue for the world’s best freestyle motocross riders to display their talents, accompanied by top Irish bands Ash, The Blizzards and Director. This was the biggest course ever to be used for an FMX event. More than 800 truckloads containing 17,000 tons of dirt were used to build the obstacle park featuring hills up to 17 feet high, and it was the premiere of the first-ever quarter pipe to be used in an FMX contest. Jeremy Lusk (USA) finished fourth ahead of Eigo Sato (JPN). 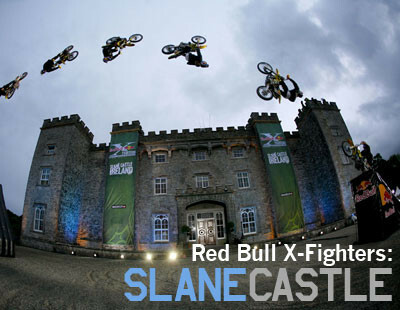 Slane Castle is the second stop of the 2007 Red Bull X-Fighters world tour, following Mexico City on March 23. The final two stops are Moscow on June 30, followed by Madrid on July 27. For additional event information, and to check out upcoming events, visit www.redbullxfighters.com.